This post is available only if you are logged in to the site as a member. If you do not have or cannot remember your password, you can you can reset it here. Alternatively to sign up for the first time, click here. The first three tend to be more "alone", the second three more "together". For further explanation, see Lama Surya's Facebook Note on Six Building Blocks. appropriate in this moment without any concern about whether they will succeed or not." in the cool shade of Joyfulness. they are but euphoric states and remain the cause of delusion. real being because they make us cross the ocean of delusion. There is suffering in seeking what you cannot find by searching. Place it in ordinary naturalness. Recognize the natural face of this placer. So be free from fixating on that concept. Is the great darkness that obscures that state beyond concept. There is a danger of conceptlessness turning into a concept. Be free from fabricating concepts. You still need to grow accustomed to the nature of nonmeditation. Without abandoning true undistracted mindfulness. When distracted you don't realize the natural state. 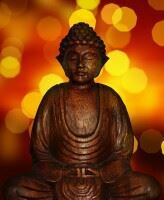 When meditating you stray intro the concept or the particular meditation. The undistracted and unmeditated continuity of freshness. It is just your present thought. Don't chase after that thought. Just look into its essence. There is no duality -- no observer, nothing observed.